Across all three subtypes, the Capped Bust Half Eagles were struck with a composition of .9167 gold and .0833 silver and copper. 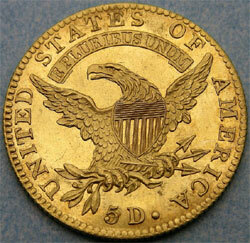 The coins have a weight of 8.75 grams or 135 grains, as specified under the Mint Act of 1792. The issues of 1807 to 1829 have a diameter of 25 mm, those of 1829 to 1834 are of a reduced diameter of 23.8 mm. Regardless of diameter all are of the same weight. By the time the later issues were minted, the face value was lower than the value of the gold in the coins, leading many to be melted. Quality of striking for the series varies, but overall quality is good and collectors should be more concerned with post-Mint marks. Prooflike fields are often encountered and can be quite pleasing, although usually the luster will be satiny.